New Kids on Campus: High School Seniors Enjoying Fridays @ Northeast | Nebraska Public School Advantage - The power of public education. Members of the Northeast Nebraska Career Academy Partnership (NENCAP) were on Northeast Community College’s Norfolk campus touring the school’s newly constructed applied technology building one Friday in late 2015 when a board member asked the question everyone was thinking. The collaboration to put together an extended learning opportunity now known as “Fridays @ Northeast” began right then and there. Northeast asked NENCAP school representation what types of classes their high school students would likely be interested in and learned about voids existing in surrounding schools’ curriculum. For superintendents like Bloomfield’s Shane Alexander, who also serves on the NENCAP board, the opportunity to maximize resources and extend student opportunity was a no-brainer. An intriguing no-brainer. 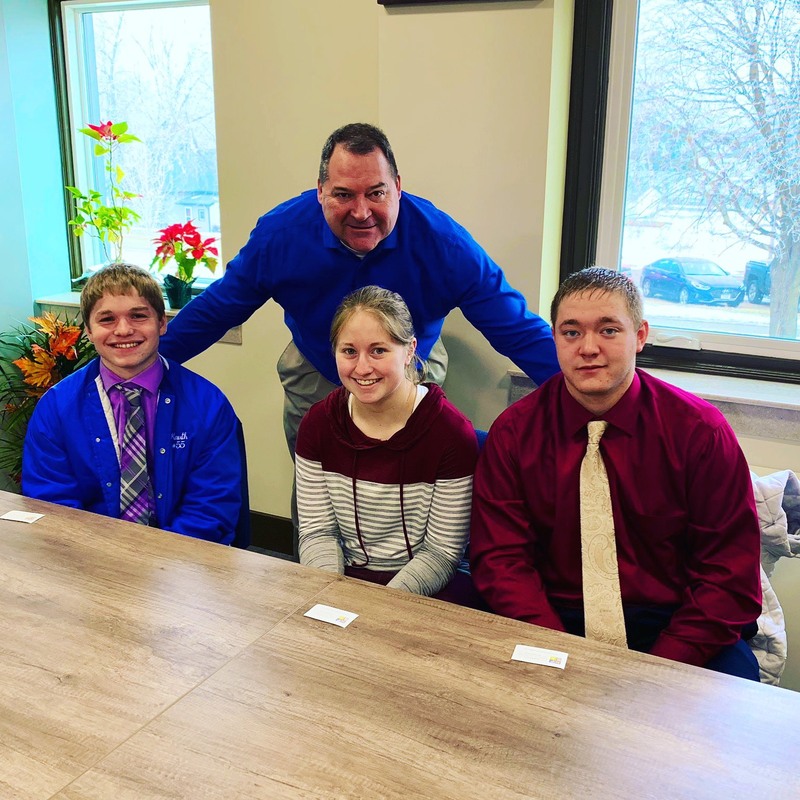 Above: Bloomfield students (from left to right) Dylan Kauth, Michaela johnson and Mitchell Mackeprang are three of nearly 85 northeast Nebraska students enrolled in Fridays at Northeast, which provides students with extended learning opportunities in several fields of study. Their superintendent, Shane Alexander, serves on the NENCAP board. The program lifted off in the fall of 2016 with 42 students. Three years later, nearly 85 students take classes on Fridays @ Northeast, most at the Norfolk campus, but some in South Sioux City and O’Neill. 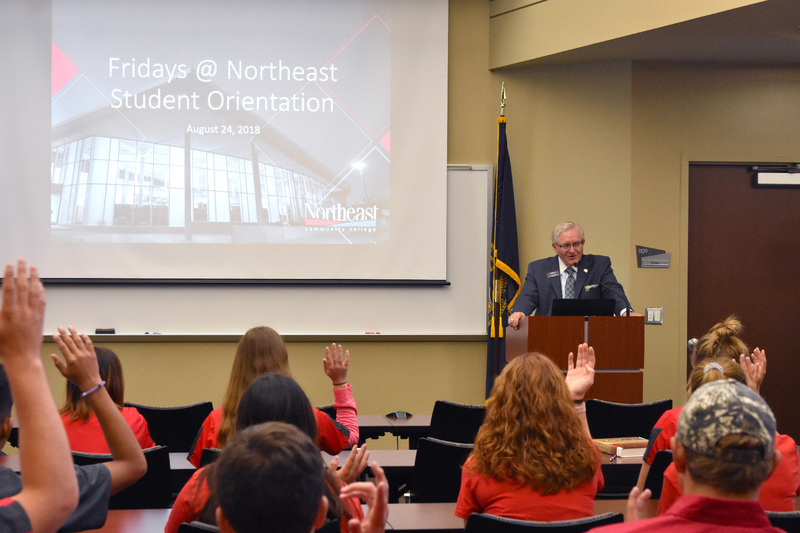 “Serving the 20 counties we serve, it’s important to us to have a variety of areas of study available and to offer a location that is somewhat nearby,” Williams said. "We are always looking to expand. We just look for the direction and lead of our high schools." The curriculum offered is extensive. The brochure is two pages long (Check it our here! ), with classes in automotive technology, manufacturing, early childhood education, health and wellness, and welding. One of the ultimate goals, for small districts and Northeast alike, is to lure skilled workers back to Northeast Nebraska. Bloomfield had two young ladies last year who were interested in becoming nurses enrolled in the Fridays @ Northeast program. By the time the two graduated, they were medical CNAs and landed jobs in the summer. Other students have enrolled in welding programs as high school seniors and been able to get a jumpstart on their college degree. Bloomfield invests in its students, even after they’ve earned a diploma. Fridays @ Northeast is also a cost-effective program. Bloomfield students, for example, have their classes paid for by their School Board as long as they pass. And, if a student enrolls in a class and discovers the field just isn’t for them, that’s perfectly fine. Helpful in the long run, too. Michaela Johnson is a senior at Bloomfield who has enjoyed the hands-on agriculture opportunities at Northeast. She’s still undecided on what she would like to pursue next year, but the program is helping her find her way. Mitchell Mackeprang and Dylan Kauth are also Bloomfield seniors enrolled in Fridays @ Northeast’s agriculture program. The three students carpool to Norfolk, and would encourage future Bloomfield seniors to jump at the chance to do the same. Mackeprang also takes a dual-credit calculus course and hopes to spend two years at Northeast before finishing his degree at USD to become a Certified Public Accountant (CPA). He’s enjoyed mingling with seniors from other nearby towns. For Williams, it’s fun to see the high school seniors assimilate to life on a college campus. Northeast has recruiters visiting school districts throughout the year, but one of their most effective forms of recruitment is word-of-mouth. Students leave campus, return to their high schools and talk about their experiences and what it’s like being a college student for one day a week. Bloomfield graduates who participate in Fridays @ Northeast, for example, are asked to come back during Christmas the following year to partake in a Q&A session with juniors and seniors. The session takes place over the better part of an afternoon. When asked about the type of kids the program draws, Williams notes the work ethics of area high school seniors. Alexander sees the same in his students.